I opened it and have had it on several occasions already. It is reminiscent of Wray & Nephew Overproof White (the world’s best-selling traditional rum) – but being 80-proof, is much easier to drink neat. It also has the maturity and slight flavor of wood that is not found in the Wray & Nephew. I love Métis. I only hope there will be some left for the rarities tasting! Others tasted were Maraska Maraschino and Briottet Marasquin. Maraska’s product seemed to the tasters to be poorly distilled, while Briottet’s seemed just too low in proof for the marasca brandy flavor to come through in the liqueur. Others tasted were Senior Curaçao of Curaçao and Marie Brizard Orange Curaçao. Senior’s product seemed worthy to the tasters, not least for it’s bitterness due to the fact that it is made of the the peel of the Curaçao orange without being mixed with any less-bitter variety. Some would find this product too bitter, even though very sweet. The tasters agreed that Marie Brizard’s product had no detectable bitterness and it was wondered how much Curaçao orange peel was used in the making. Briottet’s product seemed to have the perfect balance of bitter and sweet. Maybe someone at Southern Wine & Spirits will wake up and make this available to us here in the Los Angeles area. Grand Marnier Cordon Jaune is not to be confused with the more recognizable Cordon Rouge (orange-flavored brandy liqueur). Others tasted were Luxardo Triplum, Joseph Cartron Curaçao Triple-sec, Gabriel Boudier Curaçao Triple-sec, Briottet Curaçao Triple-sec, Combier l’Original, and Cointreau original. The Luxardo was favored by the tasters as a higher-quality selection that could be a viable ‘well’ product. Both Gabriel Boudier’s product and that by Briottet were thought by some tasters to be worthy of honorary mention. The biggest let-down was Combier’s product. It seemed that most of the flavor of the orange peel was distilled right out of the product. I felt all along the the top spot would go to either Cointreau or Grand Marnier Cordon Jaune, and it wasn’t immediately clear which was better. All the tasters remarked that Cordon Jaune was obviously distilled very skillfully and that, compared to it, Cointreau carried a slight harshness that was not part of the bitterness of the Curaçao orange peel. The consensus was that Grand Marnier Cordon Jaune was just slightly better than Cointreau original. Maybe someone at Southern Wine & Spirits will wake up and make this one available here in the Los Angeles area, also. Most readers will probably be more familiar with Grand Marnier Cordon Rouge than Grand Marnier Cordon Jaune. Though Cordon Jaune is a long-available product in Euruope, it is not available in the U.S.A. Since most orange-flavored brandy liqueur is made by blending aged brandy (often that from Cognac) with Curaçao liqueur, I suppose that it should be of no surprise that Marnier-Lapostolle made Curaçao liqueur. I recently took delivery of a bottle of Cordon Jaune. When comparing Cordon Jaune to Cordon Rouge, one notices the lack of brandy in the Jaune. It might be like tasting Bénédictine liqueur after only having had B&B liqueur. In fact, if Cordon Jaune were marketted in the U.S.A., It might be more useful than Cordon Rouge. Being able to mix Cordon Jaune with whichever Cognac brandy I preferred, and in whichever proportion I wanted, would probably make stocking Cordon Rouge redundant. 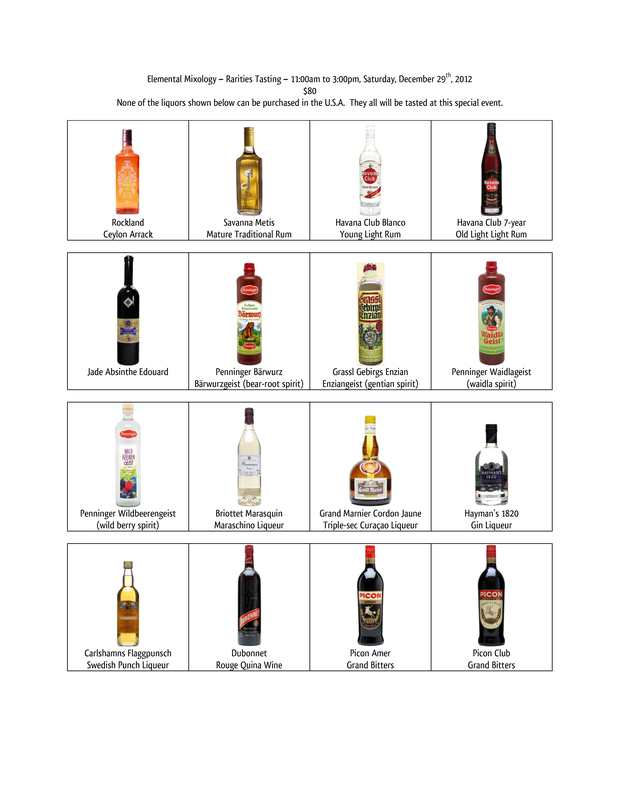 Since it is a triple-sec Curaçao liqueur, Cordon Jaune should be compared with other high-quality triple-sec Curaçao liqueurs like Cointreau (original) and Combier. Compared to Cointreau (original), Grand Marnier Cordon Jaune seems a little less-sweet, but carries a slightly stiffer sensation of alcohol. Cordon Jaune carries more orange peel in the mid-taste, while Cointreau carries more of it in the after-taste. Compared to Combier (the first triple-sec Curacao liqueur), Grand Marnier Cordon Jaune seems more skillfully distilled and without any of the questionable heat of Combier. In my opinion, there is real contention between Cointreau (original) and Grand Marnier Cordon Jaune. If you like your triple-sec Curaçao liqueur to be mostly free of the sensation of ethanol, slightly to the sweet side, and with plenty of orange peel after-taste, you will probably favor Cointreau. If you don’t mind a little sensation of alcohol in your triple-sec Curaçao liqueur, prefer orange peel in the mid-taste and don’t mind the fact that it is a little less sweet, you will probably favor Grand Marnier Cordon Jaune.